I am interested in how you got to the operating margins of the movie. I would assume one could look at the budget of the movie as COGS, thus box office revenue less budget gets you to a gross profit. 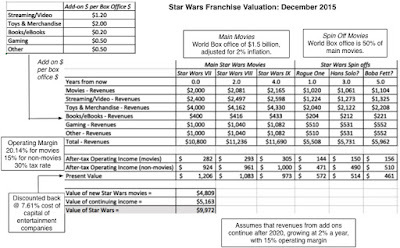 Thus, if TFA's budget of $200mm is accurate (meaning that is all it takes to generate the $2bn in box office revenue) and it ends up generating $2bn in sales its gross profit would be $1.8mm (90%) implying 70% or $1.4bn is SG&A...I don't see how that can be the case. Given this, I would surmise that the "budget" figure is not an accurate figure for COGS. Is that correct? If so, it brings me back to my question of how did you formulate the 20% for operating margins? As a follow-up to my comment, I noticed in your spreadsheet the note of "average margin for entertainment companies". 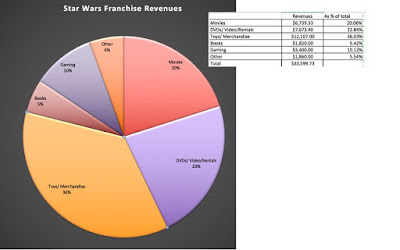 However, I would contend that that is not a reliable metric given the Star Wars movies are far from average and it has the benefit of being able to leverage the value of its brand certainly more than average movie and possibly more than a premiere franchise. This brand in the marketplace (almost thinking of it as historical CapEx) I would think allows it significant operating leverage. For example, TFA could have spent $50mm less on advertising and their revenues would have dipped less than an average movie reducing its advertising spend by $50mm. The 20 percent is the collective operating margin for movie companies. The question that you raise is an interesting one and there is no easy answer because it depends on (a) the cost of making the movie, (b) the advertising budget for the movie and (c) the profit sharing with others involved (producer, director, actors) in the movie. The rumored number for Disney to break even on this movie is already well above a billion, suggesting that the marketing costs are huge. There is a point (my guess is $1.5 billion) at which the margin not the additional revenues will be much higher. To be honest, the value is not that sensitive to movie margins, since it is more driven by the add-ons. 3) Then you have considered the non-movie margin of 15%. My question is, shouldn't you have considered non-movie numbers (past, 2015 and future) for estimating present value of perpetuity from continuing income? 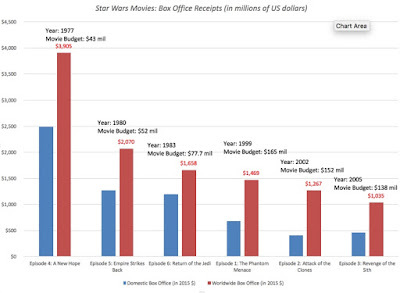 The $1.514 billion in 2015 was not movie but merchandise revenue, pre the new Star Wars movie. This ongoing stream is therefore only the merchandise stream, scaled up to reflect the higher demand created by adding a new generation of Star Wars fans after 2020. That is why the margin is only the margin on non-movie stuff. ...and what about the pre-tax margin on non-movies ? does this also come from average margins for entertainment companies ? Additionally, what impact does the total decimation of the Republic Senate have on these numbers? Does this impact the intergalactic exchange rate? Will Rey’s quarter portions perhaps be increased to a .86 portion? -Does Poe’s jacket become more valuable on Fynn? -If she has been around for 1,000 years of inflation, why is Maz still so tiny? -Can Chewbacca sell his crossbow at face value now that Han has touched it? We would also then have to consider fiscal impact of the Empire’s rise via the First Order. Now, the Death Star alone has been valued at $852,000,000,000,000,000 (http://www.forbes.com/sites/carolpinchefsky/2012/02/21/how-much-would-it-cost-to-build-the-death-star-from-star-wars/). Ponder that for a moment. The First Order returns just three decades later with the Starkiller base, easily 9.64 times the size of the Death Star with 6 times the destructive power. Which assets are not factored here in funding the First Order since the destruction of the Empire? Could this imply resurgence by Lord Vader himself? Why can Supreme Leader Snoke afford such a luxury, but can’t fix his face? Additionally, what impact does the total decimation of the Republic Senate have on these numbers? Does this effect the intergalactic exchange rate? Will Rey’s quarter portions perhaps be increased to a .86 portion? 1. The studio's take of the box office is 40-60% (50% domestically), so disney's revenue for the film will not be that reported in the newspapers. The balance goes to the exhibitor. 2. Does the "budget" for the movie include advertising & promotion costs? Those often exceed the actual cost of a big movie these days. The true cost of the movie may be 2x what the papers say. 3. 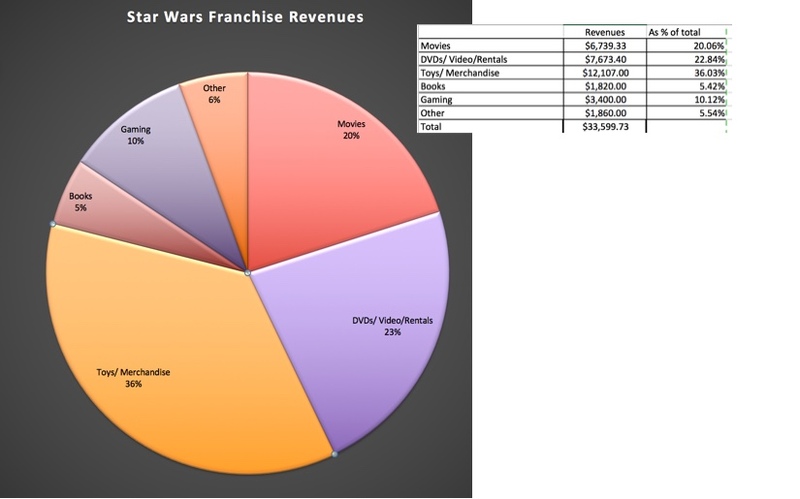 The majority of the non-film revenue will be generated via third parties (i.e., Hasbro, EA, etc. ), so the ancillary revenue to Disney will not be the headline revenue from these products. Disney also will not get the headline margins for a lot of these products either. Disney will benefit mostly via licensing and similar agreements with the actual producers of the toys, games, books. Will be lower revenue, but higher margin than you might be forecasting to Disney. 4. Most movies (big, popular movies being the exception) typically are not profitable during the cinema exhibition period. They only become profitable in later runs (DVD, TV, etc.). This will impact the valuation by pushing some profitability to later years. Additionally, now that we are in a new world of streaming video, it is unclear how the switch from the very profitable DVD business to streaming economics will affect mid-life profitability. Point is that historical norms may not apply as usual (this is one of the first big movies we have had under this new framework). Just some thoughts for your consideration. I am interested in seeing how the next level of analysis looks. Didn't the Lucasfilm acquisition include the rights to Indiana Jones as well? 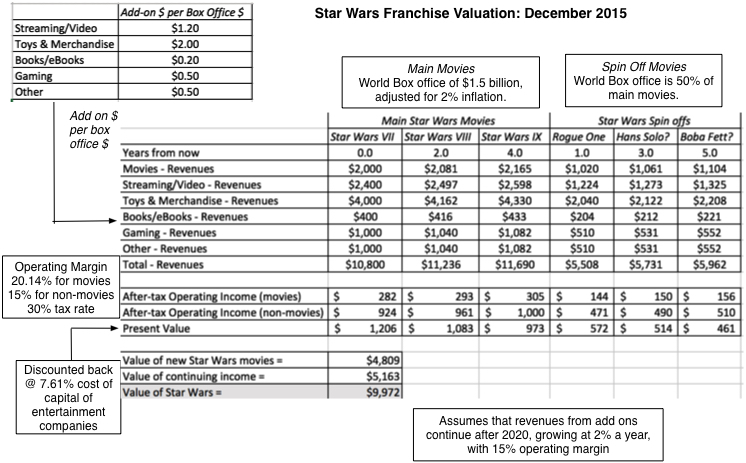 Using your number and assuming 3 Indy movies aa successful as the Star Wars spin-offs, including steaming and gaming but zero for books and merchandise, that would add another c$1.5bn to your valuation. Excellent point Simon! And Bob Iger just confirmed there is an Indiana Jones movie coming! Harrison might get another one of those huge paychecks. I agree with you on the potential for the Indiana Jones sequels. The one difference is that the previous Indiana Jones movies rights reside with Paramount and Disney cannot use them. Also, the potential for merchandising on the Indiana Jones movies is much smaller than Star Wars. What about incremental theme park sales? I did not value any synergies. To the extent that they exist (and I believe they do), that is icing on the cake for Disney but it should not be treated as part of the franchise value, since if Disney sells the franchise or spins it off as a stand alone enterprise, this synergy value would not accrue to the franchise. (1) carryforward of a prior franchise: which can be modeled based on a prior revenue stream. 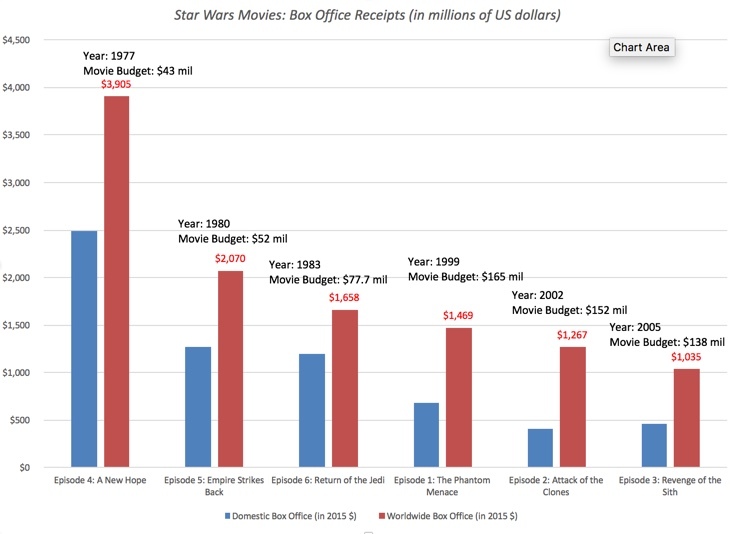 (2) New revenue from movies sequels: Isn't it a case of Real options. Can it be valued in some other way? This is a very interesting analysis, thanks very much. 2) Consumer Products (Toys, Games, Books etc) are mostly licensed. Disney gets exceptionally high royalties on Star Wars but even so this is likely no more than 10 cents on every retail dollar after the retailers and licensees get their share. 3) The Disney Stores and Theme Parks likely saw huge increases in merchandise sales from Star Wars (physical and online) but not all is incremental as other brands e.g. Marvel were likely substituted. The same is true to lesser extent for general licensing. Hi Prof. Damodaran - It would be great if you publish a follow up valuation with the recent announcement of Disney-Fox.